A box I packed on the day God set me on a new course. 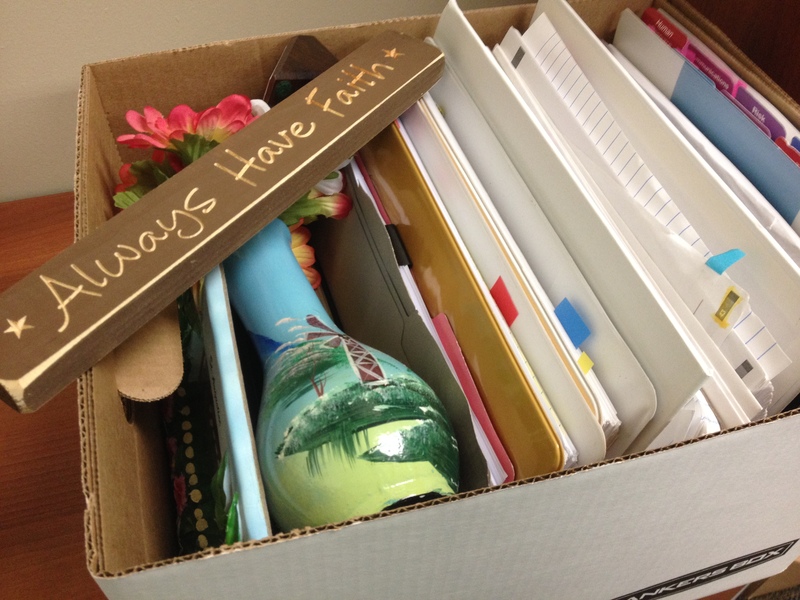 I just love the prophetic message of the sign I packed (Always Have Faith)! I like to know where I’m going. If it’s a long trip to somewhere new, I still print out the directions so I can see all the different turns I’ll need to take along the way. It gives me a sense of security, as if I have more control over the situation. Last month, God surprised me when He set a new course for my life. It seemed like I had been dropped out of an airplane unexpectedly, only to realize that I had been wearing a parachute the whole time. Or perhaps it was more like I had to brake sharply in the middle of the interstate during rush hour, only to drive over the median to head in the opposite direction. It was definitely something like that. I graduated with a degree in Risk Management and Insurance in 2003. Although I’ve held several positions since then, I thought I had finally settled on my true career path two years ago when I landed a great job as an enterprise risk analyst with an insurance company. My boss was fantastic, the benefits were good, and life was great. But then things changed at work, and it wasn’t so great anymore. I prayed about it and figured God would either change the situation or change my heart about it; at least, that’s what He had done in the past. Instead, God had something else in mind. It all culminated one afternoon when I was cleaning out my office so I could move to another location. I had been praying all day for God’s wisdom and guidance, and I felt His Spirit with me. As I finished wiping the white board, I heard Him clearly say, “It’s a clean slate, isn’t it?” Instantly, I knew that He was calling me away from my job, my paycheck, my benefits, and my security, and He was calling me toward…something unknown. All I could say in return to God’s question was, “Yes. Yes, it is a clean slate.” That’s how I acknowledged what God already knew—that I would follow Him to somewhere new. Within a couple days, I heard God clearly tell me to reach out to Burke, someone I had served with on the board of my Christian College. Throughout the day, God strongly urged me to reach out to Burke so, as soon as I could get my resume together, I emailed it to him. I didn’t know if he had any openings in his small business, but I explained that God led me to reach out to him. Burke replied within only a few minutes. He said he was in the process of expanding his promotions business and that his plan involved the opening of a café and Christian gift store. He had already decided to reach out to me to see if I wanted to be a part of his new venture. We were so amazed that God had put us together for His purpose, we began to move forward unquestioningly! That day in my office, God (my spiritual GPS) told me to “Stop,” so I quit my risk analyst job at the end of August. God then told me to “Take the next right,” and I started working with Burke in his business. This has been an amazing experience, and I’ve truly enjoyed my new position. I’ll be sure to share more with you in an upcoming blog. However, the point here is that I didn’t know how these turns would work out; I just had to step out on faith. That’s how God wants us to live our lives—in complete surrender to Him. If we knew what our future holds, we wouldn’t have that same faith; we’d just have knowledge, which could easily become an idol. I don’t know when God will direct me to take a sharp turn again, or even how far away I am from my ultimate destination. But I trust that God can see the full journey ahead of me, and He’ll get me where I need to be if I just follow His guidance each step of the way. Have You Taken a Turn? Every day, I hear more stories of God calling people to new adventures. Do you have a story? Please share it with us in a comment to encourage other readers in the faith. Great post. Thank you for sharing how God is working in your life.